Building your own kernel isn’t easy, and for the most part what you want is just to tweak driver settings. So it seems strange that, after all this time, nobody has made a “kernel this” tool which builds a hardware-specific kernel, initrd etc. Some of our systems rely on a large number of environment variables that get loaded via .profile or .bashrc, but most importantly the PATH variable. Under Ubuntu and Fedora 9+ this stopped working when using “ssh <host> <command>”. After much googling and head scratching, I finally found the cause. Using OpenSSH’s ssh in command mode, e.g. ssh dev-strat stophost, results in a non-interactive login, for which “PS1” is not set. So if you’re having a hard time getting your ssh commands to load their environment… Check for that. Ubuntu 10.4 (Lucid Lynx) the “Long Term Stable” release (LTS) went gold today. And I’m really taken with it. Ever been curious about Linux but figured it as too much hassle? Or got as far as looking at screenshots and fell about laughing? If you download and burn the CD installer, it will default to booting up in “Live CD” mode. About a minute after booting the CD, you’ll have an all-features Linux Desktop running on your system without touching your hard disk. Remove the CD and reboot, and all traces of it are gone. Any files you download/internet history/changes you make are held in RAM only, so once you reboot, they’re gone. You can mount your Windows disks if you want; or you can access a USB drive if you want to save stuff permanently. Ubuntu has an (optional) Windows-based installer called Wubi. 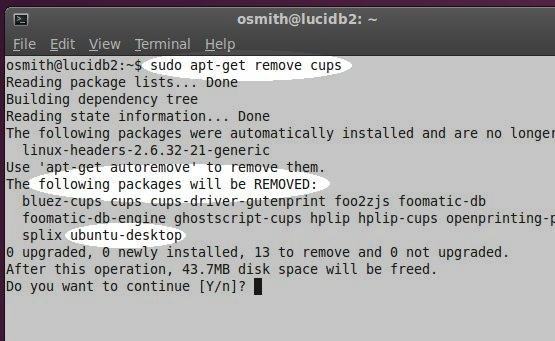 The really great thing about trying Ubuntu this way is that — should you decide it’s not for you … Just boot back into Windows and use Add/Remove Programs to uninstall it! Several Virtualization platforms, including VMware (free VMware Player), Parallels and Sun’s (free) Virtual Box are Ubuntu-smart: when they see they you’re booting a new Virtual Machine from a Ubuntu image/CD, they’ll pretty much answer all the installer’s questions for you, install their performance-enhancing tools, and finally present you with a sweet operating system in a box. Just got done adding a Login Queue system to the auth host (I have to add it to Playgate too, but it’s the weekend and it’s late and I’m gonna do that later). The nice thing about working on this particular piece of “sigh” was that I got to work mostly in Visual Studio. I used CMake to rustle up a quick .sln for the host files and the code I was writing was isolated enough that it didn’t run into any cross-platform issues. And Eclipse always feels just a little too sluggish under Linux. I really can’t work up any enthusiasm for spending any of my own time learning Eclipse enough to recreate the project under Eclipse. So I guess it will be Code::Blocks and command line svn. Bah.